Flip Out Mama: Fisher Price Laugh & Learn Smart Screen Laptop Review! Fisher Price Laugh & Learn Smart Screen Laptop Review! 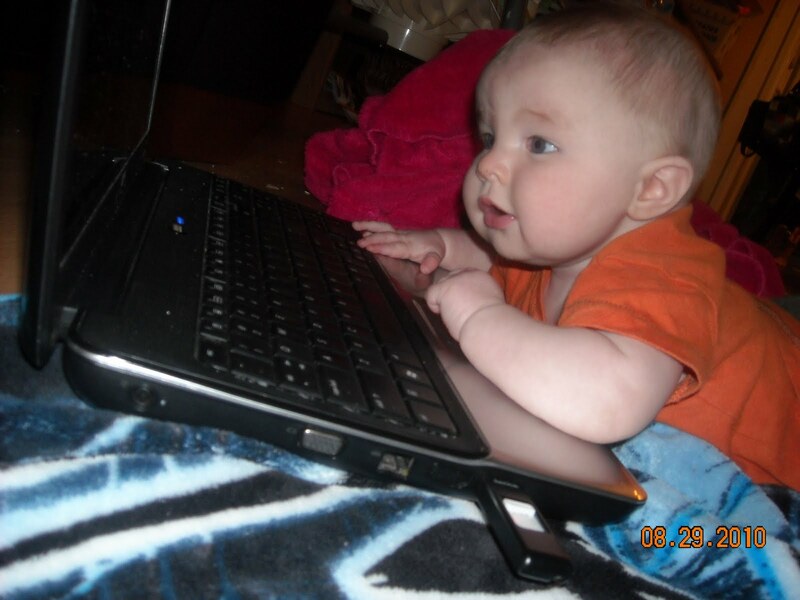 My sweet little Bean has blogger genes. Or, at least, that's what I think. Out of the 9 million times a day I tell him "No/Stop/Get Down/Leave That Alone" I would say 99% of those times, it is pertaining to leaving alone my laptop! He has always been that way! This picture was taken about a year ago, when my Bean was around 4 months old! He's just always loved computers! 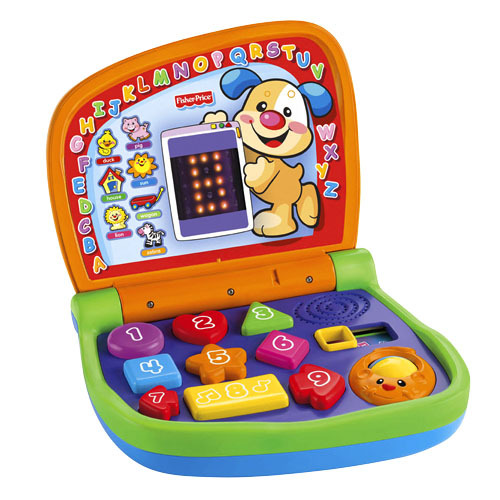 So, when I recently got the chance to review a Fisher Price Laugh & Learn Smart Screen LapTop, I was so excited! I really love the bright colors! The keys are big and easy for little fingers to push! I was really surprised at all the different things that this toy teaches: letters, numbers, counting, shapes, colors, opposites, objects and more. It even teaches Spanish! Bean's favorite part is definitely the mouse! He loves rolling it around.. He also really likes slamming the lid, of course..But, that's okay, because now it's HIS laptop instead of mine! LOL :) This toy also has several really cute songs that he likes to dance to! It is really funny! 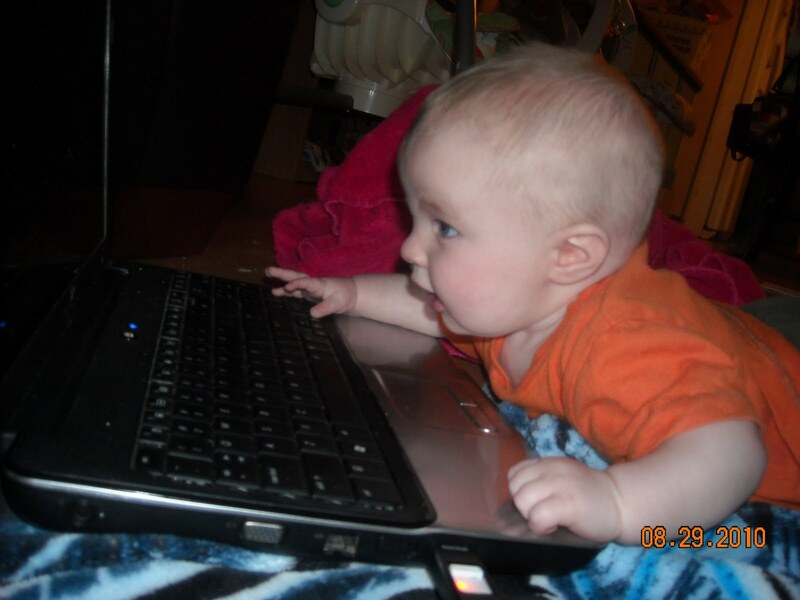 He also really likes when the numbers, letters and shapes pop up on screen. He always has had a thing for lights, and he says "ooooh!" every time something pops up on the screen! It's so cute! This toy has really held his interest, a lot more than any other toy that he has owned so far! I should have known that it would be a good one... You can always count on Fisher Price to provide fun, durable, educational toys for your kids! I'd say we have more Fisher Price toys in this house than any other brand combined! Don't think that Fisher Price is just for babies! They make a ton of wonderful toys for big kids too! Tater loves Power Wheels, and Imaginext toys are his very favorite! So, moral of the story, no matter what age your babies may be, Fisher Price has something for them! 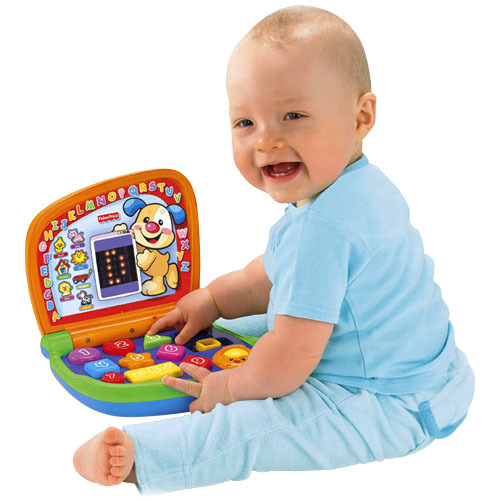 Thanks Fisher Price for getting my baby his own laptop! I don't like to share! disclosure: I was provided with the above mentioned product in order to conduct a review. All opinions are solely mine, and no monetary compensation was received.